Persons with vision impairment are as normal as those with eyesight. They have similar aspirations, abilities and desire to learn as any other person. The only thing that differentiates them from the ‘sighted’ is their lack of visual interaction with people, things and the overall environment. However there are other ways they can use to engage. What they also lack is an accessible environment and encouraging attitude from people around them. Going through school, college and later securing a job becomes doubly challenging for blind people if their abilities are discounted simply because of their inability to see. Inas Martis is a 25 year old student of 2nd year, pursuing B. Com from a mainstream college in Alibag, Maharashtra. He was born blind but his family accepted him with full joy and brought him up as any other child. However his parents weren’t aware of special schools for the blind, so Inas was enrolled in a mainstream school. Studying in a school with sighted peers and teachers was very difficult as Inas battled with visual forms of teaching. He dropped out of that school after Class 4 and then for two years he struggled to get admission in another school. 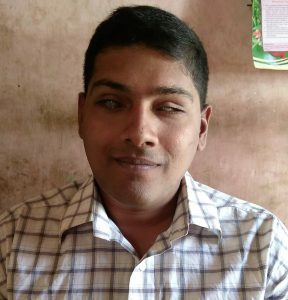 Most schools denied admission on grounds of his visual impairment but he somehow managed to enter school again and struggled to study. Inas was curious to learn new things. Many a times he grasped knowledge from television and his group of friends. He liked to watch Discovery channel which inclined him towards opting for Science stream in Class 11. But that proved to be a challenging choice as he faced a lot of difficulty in pursuing it. He had to rely on a reader for his syllabus as he had no knowledge of Braille and there was no audio syllabus for the same. And when it came to writing his exams, the school principal allowed him to use a scribe from one grade lower and Inas faced challenges explaining concepts to the writer. The difficulties made him lose interest in a subject of his choice. But he didn’t give up entirely. During his visits to his local church he found out about screen readers used by visually impaired people to access computers. He got a demo version of JAWS (screen reading software) and tried to learn through online tutorials on his own. Later while helping one of his friends in their import and export business, Inas developed a keen interest and thought of setting up a business of his own. He realised he would need a degree in Commerce, so he enroled for graduation in the subject. But here again he struggled with the course material expecially because he lacked proper understanding of Mathematics. He learnt about Eyeway from a local NGO and he called our Helpdesk for guidance. Inas shared with the helpline counselor, his deep interest in setting up his business to become financially independent. He wanted to prove his worth and also support his family. He wanted to gain proper know-how of accounts, business, English language etc. before he could operate a business on his own. Realizing that Inas needed support to help realize his potential, Eyeway counselor offered step by step assistance on various fronts. Foremost, Inas was apprised of the latest scribe guidelines for visually impaired students, which helped him get a scribe from the same level and subject. As a result he didn’t face any difficulty in appearing for his B.Com exams. Secondly, for strengthening his subject knowledge pertaining to Maths and Accounting, Inas was put in contact with a teacher at Victoria Memorial School for the Blind in Mumbai. To improve his English speaking and understanding, the counselor advised him to regularly listen to audio books, watch English films and even refer to the internet for easy resources on the language. As for financial support to setup his business in the future, Eyeway told Inas about loans offered to persons with disabilities under the MHFDC (Maharashtra Handicapped Finance and Development Corporation) scheme. Eyeway counsellor appreciated Inas’s focussed attitude towards his goals and his love for his family. He culled out the best from his surroundings. His native place Alibag is a tourist hub so he thought of starting an Export and Import business. He is conscious of the fact that he needs to brush up his communication skills. He is not leaving any stone unturned and acquiring adequate knowledge to support his ultimate dream.